As the rest of the country continues to get blasted by a very harsh winter, one of the coldest on record, we have been very well protected by a ridge of high pressure which has moved up the coast and is keeping us in warm weather and sunshine. Hard to complain about the weather. This should continue for at least the next 10 days. I will talk about day 10 shortly. First I want to show some charts on just how dry our weather has been. This first map represents what is our traditional rainy season. Of course we know we were nearly shut out of any rain whatsoever. Notice almost all of Northern California has picked up less than 5% of the average rainfall for the rain season. Pretty Amazing and potentially catastrophic. 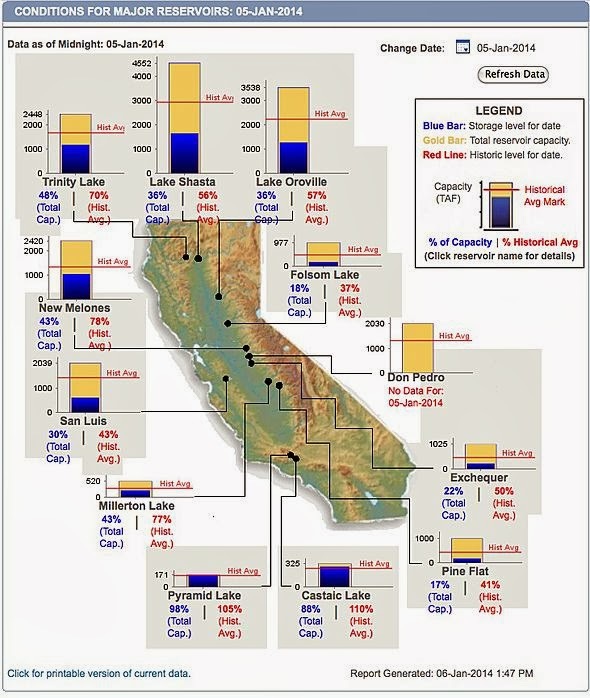 The major reservoirs in California are in big trouble. When they should be filling up, they are getting no water. In addition they are all very low because of the record dryness of 2013 (See Previous Post). I have been searching for the better part of two weeks for one of the long range models to give us a hint that this dry spell is ready to break. However, there has been nothing. All of the storms, big and small are simply incapable of going over our ridge and providing us with any relevant precipitation. The ridge is just too strong. The largest of the storms climb over the ridge and displace it, but in so doing, have nothing left and fall apart. Other storms are simply pushed north. Still other storms split, weaken and die. 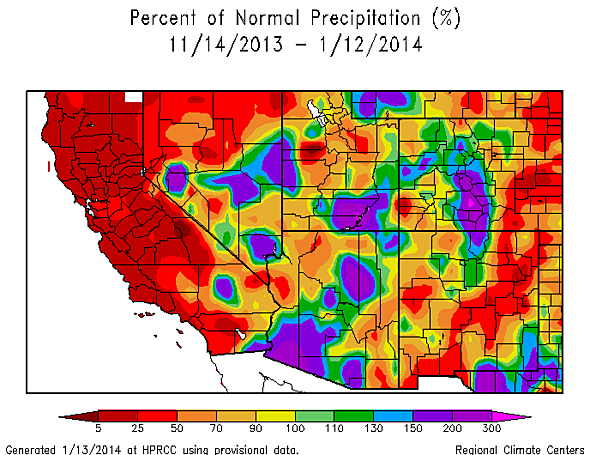 The entire west is dry, we just happen to be the driest. Looking at the EC model run from this morning, there is now a hint that perhaps our ridge may finally start to move out of the way and provide an alley for storms to come down the west coast and provide us with much needed precipitation. Of course this was just a hint. Sorry, but that is all I have. I will keep an eye on this and post some images if the forecast holds together. It has been very dry. However, I seriously doubt that the storm season is a lost cause. We have recorded 200 inches of snow in March before. The current time period is traditionally dry. Even our record breaking wet years traditionally recorded a dry January. With February comes new hope as the models are at least hinting that a change could come at the end of the month. Rose has done an excellent job of opening terrain, even with the warm weather. For more, visit my friends at Unofficial Mt. Rose.